Smartwatches and smart bracelets have made it possible for us to receive notifications without having to look at our phone constantly. Now imagine a device that doesn't require you to even look at your wrist. This is the idea behind NY-based fashion tech startup Peripherii Inc.'s wire-free and hands-free smart earrings. As much a stylish piece of jewellery as it is an impressive piece of tech, the Peripherii is a hearable that can whisper your notifications into your ear. 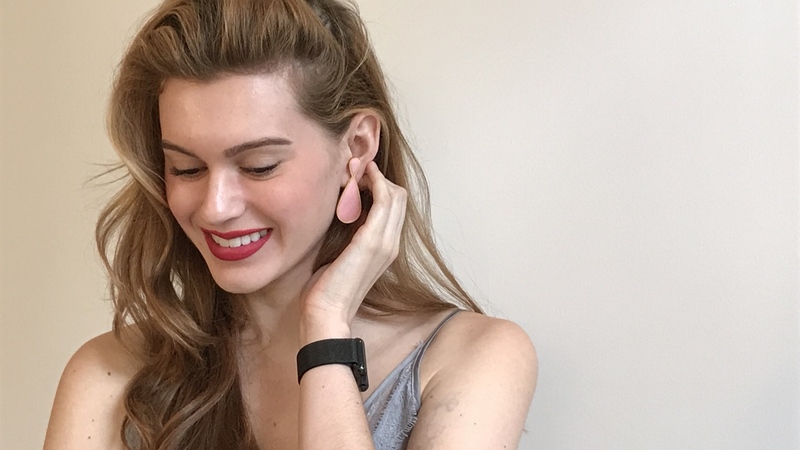 Designed to be used with your smartphone, the Bluetooth earrings cleverly hide a slip-on module that harnesses the power of voice assistants such as Siri and Google Assistant. Here's how it works. There is just one smart module so you choose which earring to interact with and can mix and match. Inside is a microprocessor, battery and a microphone for your voice commands. There is also a speaker – Peripherii doesn't use an earbud which goes directly into the ear, instead it hovers over your ear canal. The earring allows the wearer not only to take and make calls via the voice assistant but also to do things like order an Uber, set a timer and text a friend. Essentially, a Moto Hint or Sony Xperia Ear in earring form. "Earphones get tangled. Earbuds fit poorly and are easily lost. Plus they are not exactly stylish and often weighed down with sensors," co-founder Sonal Budhiraja told us. "Our goal was to offer a piece of jewellery where the functionality felt like a bonus because of its ease of use." The patent is still pending but the startup's aim is give the user distraction-free access to their smartphones. Co-founder Priti Moudgill, who has held research/engineering positions at IBM, explains, "For ease of adoption, we decided early on that our earrings had to work right out of the box. The setup is quite easy. Once paired; the earring will be able to take and make calls with the press of a button or a voice command." Could this female-focused hearable eradicate the familiar buzzes and light flashes that smart rings and bracelets use? Well, there's no denying that earrings that can talk directly into your ear are quite impressive. Besides that, another great feature is that when paired with LTE smartwatches, the Peripherii smart earrings eliminate the need for you to take your phone with you. The two women, both engineers, debated as to whether they should add tracking and wellness-related sensors, but decided not to. "After witnessing the woes of sensor overkill and the related drain on battery life, we decided to prioritise ease of use and quick adoption over any added bells and whistles," admitted Priti. They also chose to hold off on creating their own companion app to side-step another layer of complexity. Down the line, the duo are willing to consider adding an app for access to Alexa APIs, if they see a compelling use case beyond what they currently have. "For now, we think that the style quotient and wear-and-go convenience of our earring is a much bigger selling point than a panoply of sensors," said Budhiraja. Targeting multi-tasking women who enjoy being connected, the founders admitted that their first challenge was how to overcome the fact that one look does not fit all. "This was something that we tackled head-on. The 'pair and wear' earrings come with a tech-module that is interchangeable between many different facades," said Moudgill. The iOS and Android compatible costume-style earrings weigh just 4g each and have been designed to suit a wide range of fashion sensibilities, coming in different shapes, colours and finishes. Peripherii will be available during a crowdfunding campaign, launching at the end of October 2017. The earrings will initially be offered at a discount price of $159, for early bird pre-orders, and priced $295 after that. The next step for the startup will be forming partnerships that fit in with their fashion tech agenda beyond this first crowdfunding push. "We are excited to collaborate with jewellery brands, tech companies and other corporations looking for B2B solutions", said Budhiraja. "We are also interested in collaborations with companies that offer bento-box of style fixes," added Moudgill. The starting point is the attitude that the products that matter are those that free us. "Whether they are wearing them for work, casual-wear or evenings out, the lack of pockets is no longer a problem," said Moudgill. "They no longer have to carry their smartphone in their hands to allow for quick access. Peripherii earrings are the solution that will allow women to finally get over their pocket-envy."